Afghan President Ashraf Ghani, seen speaking in February in Herat, Afghanistan. 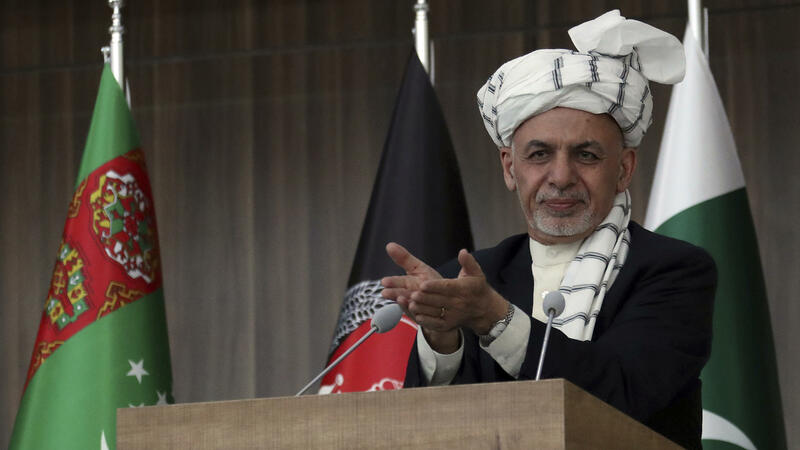 Afghan President Ashraf Ghani has extended a significant peace overture to the Taliban, unilaterally declaring an unconditional cease-fire with the militant Islamist group on Thursday. Ghani said the peace in Afghanistan will begin June 12 and will last for roughly a week as Muslims mark the end of Ramadan. The cease-fire does not include al-Qaida or the Islamic State. "This ceasefire is an opportunity for Taliban to reflect on the fact that their violent campaign is not winning them hearts and minds but further alienating the Afghan people from their cause," Ghani tweeted Thursday. "With the ceasefire announcement," he added, "we epitomize the strength of the Afghan government and the will of the people to achieve a peaceful resolution to the Afghan conflict." The Taliban did not immediately comment on the proposed olive branch. To this point the group has declined to take Ghani up on his increasingly urgent peace gestures this year — including the Afghan president's move in February to offer the Taliban legitimacy as a formal political party and release the group's prisoners, provided the insurgent group comes to the negotiating table. But as those moves have been met largely with silence, violence has continued to roil the country. The United Nations tallied 763 civilians killed and nearly 1,500 injured in just the first three months of the year. That casualty toll stands at roughly the same level as each of the past two years, but as NPR's Scott Neuman noted last month, recent attacks on major cities and government buildings — usually claimed by the Taliban, al-Qaida or ISIS — have brought increased visibility to the unrelenting bloodshed in the country. "In January, a Taliban attacker drove an explosives-laden ambulance into the heart of the capital, killing more than 100 people and wounding as many as 235. The following day, 11 soldiers were gunned down at a military academy in Kabul. "There have also been numerous attacks on government buildings and at police checkpoints." It was in response to this cascade of violence that, as Reuters reports, more than 2,000 Muslim clerics issued a fatwa — or religious ruling — "outlawing suicide bombings and demanding that Taliban militants restore peace to allow foreign troops to leave." And they're not alone in that press for peace, according to the head of U.S. forces in Afghanistan. "We've had in the past few months, spontaneous, grass-roots non-aligned peace activists around the country staging events in favor of peace," Gen. John Nicholson tells NPR's Rachel Martin. "And so I think what we're seeing is kind of a critical mass building toward peace inside the country." Yet NBC cites one unidentified member of the Taliban council who said the Taliban may be reluctant to accept the terms of a cease-fire with Ghani's government. "First, jihad is the best worship and we would like to continue it in this holy month," he said. "Second, we have already deployed our fighters in different provinces and it would be too difficult to keep them in those areas without pursuing jihad." "From the Taliban point of view, [Ghani] is asking for a ceasefire while the US is still 'occupying' Afghanistan, so it is hard for them to accept," Barnett R. Rubin of the Center on International Cooperation said on Twitter. "I think that it is important for US to come out and support it and offer to negotiate all issues, including troop presence, as long as there are measures in place to assure that [international] terrorist groups cannot exploit peace," he added. The U.S., for its part, came out strongly in favor of Ghani's efforts Thursday. Secretary of State Mike Pompeo announced that U.S. and NATO forces "will respect the ceasefire, as it applies to the Taliban," adding the caveat that "it does not apply to ISIS and al-Qa'ida, nor does it prohibit operations to defend Afghan and Coalition forces from attack." "We stand with the Afghan people as they lay the foundation for an Afghan-owned and Afghan-led peace process," Pompeo said. Other major international actors, such as the European Union and the United Nations, also expressed their support for the move — and the hope that it will actually work this time. "Peace takes the courage of dialogue, engagement, of compromise and reconciliation," Federica Mogherini, the EU's high representative for foreign affairs, said in a statement. "The moment for this courage is now, in order to build a better future for all Afghans. "I think the fact that the Taliban has not yet rejected the offer — just as they have not formally rejected President Ghani's offer of a settlement process provided back in February at the Kabul Process [conference] — indicates they may be prepared to entertain it and observe it," a senior State Department official told reporters Thursday. "And we certainly hope that will be the case," the official added, "but we'll have to wait and see how they respond."